We have several options for you to choose from when purchasing your goods. 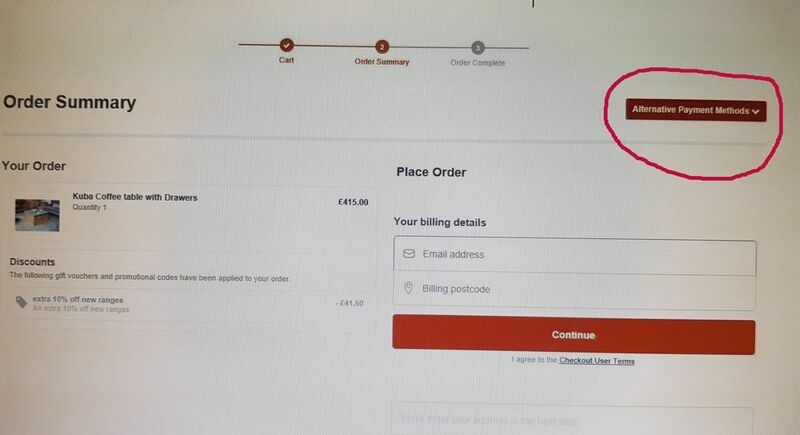 By default the payment method will be Credit/Debit card but you can select 'alternative payment methods' at the top right hand side of the checkout page as per the image below. Mastercard and Visa credit and debit cards are accepted and all transactions are 128 bit encrypted through a secure gateway. Just place your order and we will ring you to take your 20% deposit by telephone. Minimum order value must be more than £750 and a deposit of 20% is to be paid. Place your order and we will email you a link to complete your online credit application. All the details will be filled in for the order of the goods and you will just be required to fill in the personal details required. If the agreement is accepted your order will be confirmed and we will ring you for the 20% deposit.